Jacob Jones, Will Bradshaw Named To ASC Baseball Preseason Watch List. RICHARDSON, Texas – LeTourneau University baseball senior outfielder, Jacob Jones, and junior pitcher Will Bradshaw have been named to the American Southwest Conference 2019 Baseball Preseason Players to Watch list as announced by the conference office on Wednesday, January 30. 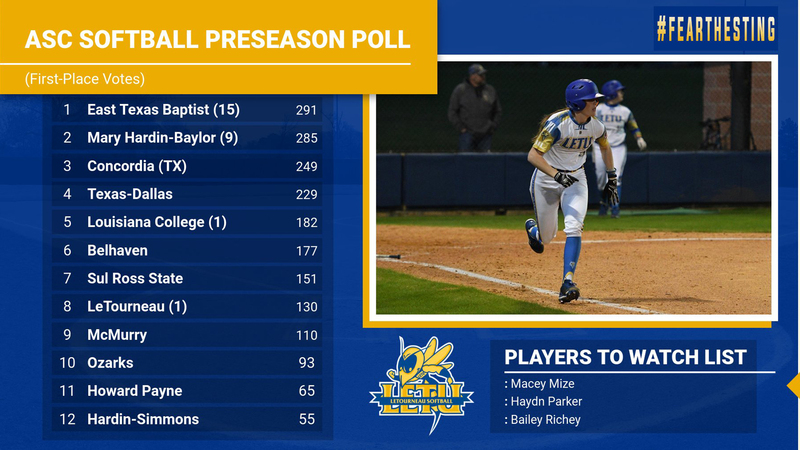 As a team, LETU was picked seventh in the 2019 ASC Preseason Baseball Poll by receiving 151 total points, well ahead of Howard Payne University and Louisiana College who both tied for eighth with 115 total points. Defending ASC Regular-Season Champion Concordia University Texas has been picked to win the conference again this year after receiving 17 out of a possible 25 first-place votes and 290 points while 2018 ASC Tournament Champions Texas-Dallas was picked second with 273 votes and seven first-place votes. Sul Ross State picked up the one remaining first-place vote and was picked third with 221 points followed by East Texas Baptist (207 points), Hardin-Simmons (194 points), and Ozarks (172 points) rounding out the top six. Reigning National Champion Texas-Tyler is ineligible for the ASC Preseason poll and postseason tournament due to NCAA Division II Reclassifying. In his first season with LeTourneau last year, Jones played in and started all 42 games for the YellowJackets and finished the year with a .277 batting average while collecting six doubles, one triple, and five home runs. Jones would be named to the ASC Tournament Red Bracket All-Tournament team out in Alpine, Texas by going 5-for-12 and scoring three runs to help LETU stave off elimination twice and make the Red Bracket Tournament final against Texas-Dallas. Longview local Bradshaw would prove to be an all-around player for LETU last year in his sophomore campaign, hitting .316 at the plate with seven doubles and a team-best seven home runs while also becoming the team closer on the mound. Bradshaw made seven appearances for LeTourneau as a pitcher and threw 7.1 innings, making five saves and going 1-0 with 11 strikeouts while allowing just one unearned run on two hits. LeTourneau University will open the 2019 season on Friday, February 8th with a non-conference game against Belhaven University in Jackson, Mississippi at 4 p.m. The game will be one of three games on opening weekend for LETU in Jackson as the YellowJackets will play at Millsaps on Saturday, February 9th and close out the weekend with a neutral-site contest against Rhodes College.